Here is a a link to a brochure regarding Michigan custody questions. It is produced by the Friend of the Court Bureau and the State Court Administrative Office of the Michigan Supreme Court. The Michigan Custody Guidelines packet contains answers to Frequently Asked Questions, an explanation of the 100-Mile Rule and factors of the Child Custody Act. The Michigan Custody Guidelines information packet also explains the process for establishing and modifying custody. There are definition of legal terms and the laws associated with Domestic Relations Litigation. 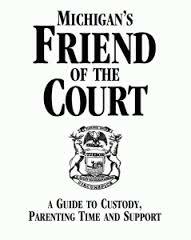 The packet also provides answers about the role of the Judge, Domestic Relations Referee, Family Law Attorney and Friend of the Court. The law office of Kathryn Wayne-Spindler & Associates can help clients through the child custody process. For assistance with a child custody or child support matter, contact the Milford, Michigan law office of Kathryn Wayne-Spindler & Associates at 248-676-1000. Our experienced attorneys help clients throughout Southeastern Michigan including Oakland, Wayne, Washtenaw, Livingston and Genesee counties. We handles cases in Milford; Highland; Hartland; White Lake; Waterford; Walled Lake; Commerce; South Lyon; New Hudson; Howell; West Bloomfield; Holly; Grand Blanc; and many more local communities.